William S. Hart Ranch & Museum: It's hot! This weekend CC and I risked heat stroke to visit the William S. Hart Ranch and Museum in Newhall -- a particularly desert-y patch outside of Los Angeles. And I'm still hot just thinking about it. The ranch, which sits on 265 acres, served as the home of silent film star and director William S. Hart after he retired from showbiz. The site offers tours of his home, pictured above -- which sits on top of a gorgeous hill overlooking the vast, parched landscape -- as well as an enclosed barnyard full of ducks, pigs, chickens and deer; picnic tables; and a smaller ranch house that has kept many of Hart's belongings intact. When we visited on Saturday, the place was far from bustling. There were a few families, but we had most of the place to ourselves -- including the smaller ranch house, which was eerily empty except for the sound of an informational film playing at the end of a long, narrow hallway. Once CC and I toured that -- and frankly, I was eager to get the heck out of there despite the fascinating accoutrements of a man clearly enthralled by the cowboy way of life -- we hit the barnyard and watched as pot-bellied pigs sought comfort in their little homes. CC enjoyed gobbling with an over-sized turkey who was hangin' with the chickens. When we made it up to the main house for the tour, I was ready for some serious air conditioning. Thank God they installed that, or I might have keeled over on the late actor's doorstep. The mansion/museum is amazingly well cared-for. The second-story living area, above left, barely showed its age. Interesting note: The Kodiak bear-skin rug was a gift from fellow cowboy entertainer Will Rogers. Apparently, the two were good friends. Next time, though, bring liquid refreshments. And lots of them. Check out my latest LA Moms Blog post: "Beware of mother bears -- you might find one in the mirror." I never thought I was the kind of mom to yell at another child, particularly in a public place -- until a little boy smacked my daughter in the park. It was a strange moment, yet totally instinctive. I know, I know. The official season opener arrived on calendars across the country last Sunday, but it's not until I catch that first scent of chlorine and feel that jarring splash of cold pool water that I can personally confirm that summer -- in all its glory -- has officially begun. This afternoon, CC and I met Pat of Eating L.A. fame in South Pasadena to try out their pool ... and the high school (aka SouthPas) track. CC had a great time. Not only did she practice navigating the stairs leading down into the actual pool, she also tested the lifeguard's patience as she leaped off of said stairs into her mother's or Pat's arms. Needless to say, there was lots of lifeguard bullhorn usage. After we left the pool, we walked next door to the high school track and just let CC run. And run. And she kinda got stuck in the soccer goal. (Adding new meaning to the phrase "Nothing but net.") Wide open spaces for CC are like donuts for her mom: Worth the obstacles and totally priceless. And once we got home, she sacked out for three hours. Oh yes, summer is here. What's your L.A. Story, Melissa Joan Hart? Yesterday I had the opportunity to chat with Melissa Joan Hart ("Sabrina the Teenage Witch," "Clarissa Explains It All") at her new treats shop SweetHarts in Sherman Oaks. We talked L.A., motherhood and about life in the entertainment industry. Melissa was a gracious hostess and gave me the inside scoop on kid-friendly places she likes to take her two young boys, Mason and Braydon. Ian and CC, meanwhile, were in the shop exploring the candy, frozen yogurt and cupcakes that help make the charming SweetHarts so, well, sweet. You can see them periodically in the background. We had a great time -- CC was a fan of the strawberry gelato -- and we'll definitely be making a return trip. Thank you, Melissa! And thanks for all of your insight into parenting and L.A.! Tonight at 7 p.m. the Levitt Pavilion Pasadena kicks off its weekly Children's Hour series. This free summer event takes place every Wednesday beginning this evening through Aug. 26. Performers ranging from puppeteers to musicians to storytellers are on board for the summer lineup. Bob Baker Marionettes, which I've written about before, takes the stage tonight. Other performers such as Choo Choo Soul (pictured above), Silly Monsters and Habla Blah Blah are also on tap for future dates. Thanks for the tip, Franklin Avenue! A couple of months ago, I was tapping away on the computer while my daughter was watching a show on PBS. All of a sudden I heard her yelling out letters: E! I! It was great, because we'd really started focusing on the alphabet, and I was eager to see which program was encouraging her to talk back to the screen -- in a good way. I turned around and saw what I now consider to be the newest Fab Four: Alpha Pig, Wonder Red, Princess Presto and the front man, er, boy himself, Super Why! 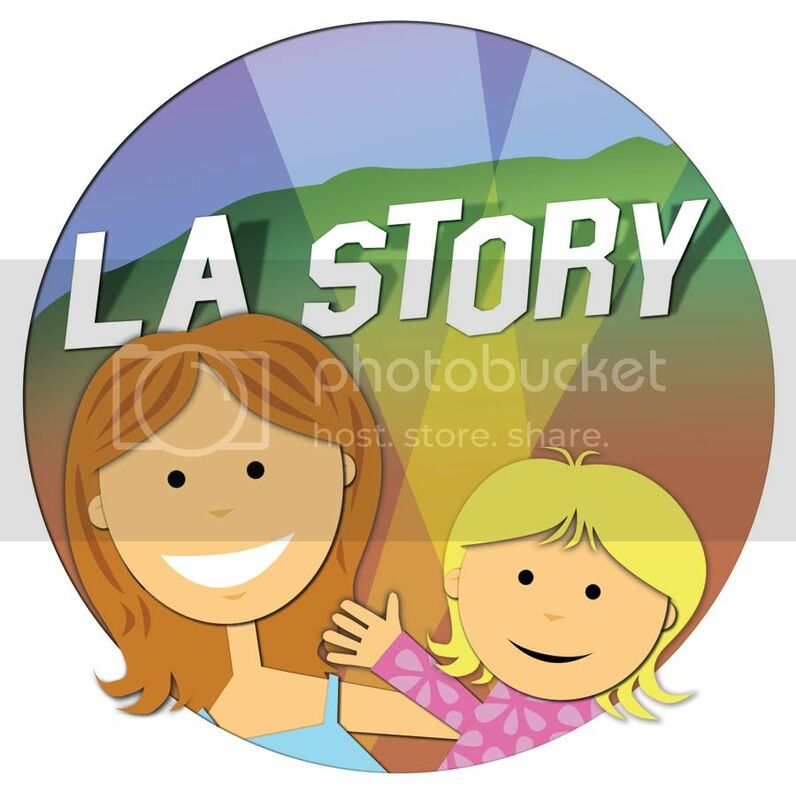 So when PBS Kids organized a meet and greet for Los Angeles mom bloggers at its local outlet KCET, I was ready to jump in a Why Flyer with CC and make an afternoon of it. The meeting was an opportunity to talk about the philosophy behind "Super Why!" and to offer feedback on what role media plays at home. It was also an opportunity to practice some "homework" to see just how educational TV can be. If you're not familiar with the animated series, it's a program created by Angela C. Santomero about four fairytale characters who solve relatable childhood problems (such as bullying) with books, vocabulary and reading. They inhabit a universe filled with the Three Bears, Jack and Jill as well as Jack and the Beanstalk (Whyatt's, aka Super Why's, famous older brother). Angela, alongside Senior Vice President of Children's Media at PBS Lesli Rotenberg, and KCET VP of Education and Children's Programming Joyce Campbell, chatted about building Super Why! based on a need. "What do children at this particular age need to learn?" Lesli asked. "Literacy." "We build a curriculum, then the show," she added. Echoing that, Angela said, "We wanted to find the best educational curriculum and put it into a TV series." One of Angela's inspirations was what happened after an episode of '70s sitcom "Happy Days": "When Fonzie got a library card on the show, library cards shot up like 500%," she said. "I want to do that for preschoolers." After the presentation -- which also offered on-site daycare and fun character visits for the kiddos -- PBS outfitted each of the moms with an at-home toolkit for our kids. It was a five-day lesson plan based on one episode of Super Why! CC was supposed to watch the same episode each day and complete activities with varying degrees of difficulty. And the first day reflected what worried me most -- CC becoming overwhelmed and frustrated. She was great watching the show, centered on the three little pigs, but when I confronted her with a full page of all 26 letters, she was easily distracted. She could pick out the correct letters if you gave her the option of just a few, but the whole alphabet was too much. What she did love was saying "Affa Pig!" and raising her arm in the air. She also enjoyed calling out letters on the screen, listening to the music, and she really loved reading the accompanying Super Why! book about Jack and the Beanstalk. She brought it over to me several times for reading time. But by yesterday, the end of the five days, she found W-O-L-F in a matter of seconds on the page with 26 letters. She filled in word blanks with ease and had greater participation in the show itself. It was amazing to see. As long as it didn't feel forced, as long as it was part of a fun day, and as long as she could learn incrementally, the setup was great. For a 2 1/2-year-old, I'm Super impressed! And I'm so proud of my daughter, but then again, I always am. Well, we're just gonna have to go back. The plan on Friday was to navigate our way west on the 10 and north on the 405 to visit the Noah's Ark exhibit at the Skirball Cultural Center. Unfortunately, an accident on the freeway left us in a virtual parking lot for more than two hours, and we arrived only 30 minutes before closing time. Bummer. But, let me tell you, my 2-year-old firecracker packed in at least an hour's worth of racing around the super kid-friendly exhibit and unleashed some, if not all, of the pent-up energy she had saved up while stuck in the backseat. Noah's Ark is a huge, hands-on exhibit that allows kids to explore by touching, climbing and witnessing the visual wonder of animal puppets -- and the towering ark itself -- created from recycled materials and everyday objects. She also pretended to cook up a meal fit for Noah and his passengers with the plastic fruits and veggies left on a galley table. It was too late for us, but kids can also craft art projects in an adjacent room that mirrors the great outdoors. Like I said, we'll have to go back. It took an extra-special kind of coaxing to get CC to leave the premises. (No, not security, but close.) The attentive staff was always on hand to answer a question or give life to a hand puppet. The open nature of the exhibit allows kids to run free but also engages them with various hands-on activities. I'm so happy that it's now on permanent display, because it truly is a must-see. Remember, though, it's best to purchase your tickets in advance (which we did, but it's not required) to lock in a specific time for your visit. They offer tickets at 30-minute intervals, but you can stay longer than that. That way, you'll only have to share your Ark time with a set number of other visitors -- and you'll avoid being overcrowded. So, when you go, allow for traffic. Allow for possible accidents to slow you down. But also allow for a wondrous time with your little ones. The Noah's Ark winner (picked randomly out of an L.A. ball cap) is ... Mike from Franklin Avenue! And the ZAP! POW! BAM! winner (also picked from the famous ball cap) is ... Prue from Spectagirl 365! Congrats! And thanks to everyone for reading the blog and leaving a comment and/or tweet! Because of Ian's love/hate relationship with sharks, I decided on a fin-focused Father's Day celebration this year. That meant hitting the Santa Monica Pier to investigate a cozy aquarium tucked just below the carousel. I actually had no idea the Santa Monica Pier Aquarium even existed until about a month ago (thank you, Twitter!). But it's an adorable little outfit that boasts a friendly staff, several touch tanks full of starfish, kelp and sea urchins, a play area for kids and the main attraction itself -- the open shark and ray tank. And a note to all you handsy folks out there (my child included): No shark-petting allowed. The Heal the Bay-managed aquarium hosts Shark Sundays every week, and at 3:30 p.m. they offer an informative presentation to accompany feeding time. It was amazing to watch these guys circle the tank while sticking out their noses and jaws (yeah, I went there) to nab some afternoon munchies. One of the staff members explained that no fingers are allowed in the tank not because the mini sharks necessarily want to bite you, it's more that they feel threatened and have nowhere to go, being in a tank and all. (And of course that goes double during feeding time!) No argument from me. My child, on the other hand, wanted to test out this theory. Luckily, we ended the day with all of our fingers and toes. What's also great about the visit is that it's only $5 per person, and kids under 12 years old are free. Actually, that's the "suggested" price. The entry fee is a minimum $2 for the 12-and-over lot. Happy Father's Day to all you rockin' dads out there! And a special shout-out to Ian, who just can't get enough of CC's love! The other night, while I was changing her diaper, CC got a little out of control and bit me. On purpose. "Biting is bad," I said. (We had just watched an episode of PBS KIDS' Super Why! explaining that good was the opposite of bad.) "I want you to be good." Blank stare from the toddler. "Are you bad or are you good?" This, I realized, could have gone on for hours. But I had more pressing matters, like a dirty diaper staring me in the face. Luckily, it wasn't anything near the worst. *** Pausing to avoid passing out just thinking about it. Letting a nonthreatening Mentos commercial play out in my mind. *** She had apparently just bumped her head on the sideboard of the table. Nevertheless, I decided to seize on an opportunity. "See," I said. "You should be good." She looked up at me with the most serious expression and nodded. So, just wondering, does that make me a bad parent or a good one? A few fellow LA Moms Blog contributors and I abracadabra'd ourselves over to The Magic Castle in Hollywood yesterday to get the lowdown on Zing Zang Zoom, the latest circus incarnation from Ringling Bros. Barnum and Bailey. Unfortunately, CC was a little too young to attend the illusion-focused event -- only children 6 and older were admitted -- but the kid in me came out as director Shanda Sawyer, special effects chief Jim Steinmeyer and "Zingmaster" Alex Ramon chatted about the upcoming show. It spirits itself to the Staples Center July 8-12. Magic, for one, was never part of any circus I attended. (An elephant relieving himself mere feet away from my seat? Now that's what I remember.) There's also a storyline! And characters! Who would've thought? In other words, this ain't your mother's circus. "The Felds (as in producers Kenneth and Nicole) wanted to take the show in a different direction," Shanda said. She also mentioned that the Felds had talked to moms, who told them they wanted an emotional through line in the show. "It felt fragmented, and moms said life is a three-ring circus as it is," Shanda continued. "Kids were also feeling overstimulated, and we wanted to keep them engaged." So, it's at the Staples Center, right? You might wonder how anyone could fool an audience seated at 360 degrees. "Can we even do magic in this setting?" Jim (pictured above with Shanda) said he asked himself at the beginning. Hopefully, that answer is yes because what they have on tap includes a disappearing elephant; kids levitating their parents in the middle of the arena (not letting CC raise her hand for that one! ); and a man "turning into" a tiger. After our chat with Shanda and Jim, we headed to another cozy theater within the Castle to talk to 24-year-old "Zingmaster" Alex Ramon and his assistant/sister Leah Christiana. The young magician, who's toured with Disney, explained that magic tricks start with an idea and a sketch, and that the entire year of 2008 was devoted to the show's creative process. The best questions for the duo came from two young boys, natch. One of the tykes was the son of LA Moms blogger Liz, who blogs over at Los Angelista. The first question was, "Are you guys better than Houdini?" (Awesome, but that's just my two cents.) To which Alex replied, "You'll have to come see our show and find out." And the final question: "How does all the magic work?" "Can you keep a secret?" Alex asked. After the little guy nodded, Alex said, "So can I." Can't wait to go back to the Castle to try out one or all of their many, many, many bars. (Those magicians sure like their spirits!) Luckily, one of the members of the secret brotherhood gave us passes. And even luckier, kids are invited to Saturday and Sunday brunch. But CC, now that you've got that cool circus hat to show off, don't get any ideas -- you know, like trying to make Mommy disappear over Eggs Benedict! Ringling Bros. has created a special price for readers. A four-pack of tickets will be only $44 when you enter the code "MOM" on Ticketmaster.com or when you purchase tickets at arena box offices. It's almost summer, folks, and Saturday, June 20, marks opening day for L.A. city pools. 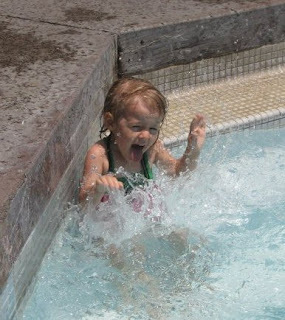 We had a great time last summer, taking CC to the pool at Pan Pacific Park. It's clean and well-tended by the hyper-vigilant lifeguards (yeah, I even got a stern talking to for taking a pic of my child splashing with her dad. Apparently, close-ups are fine, but other 'rents may not want their kid in your frame.). And it's also really easy on the wallet -- especially if you have a library card. Children 17 and under are free, and adults (18-64) are -- wait for it -- $2.50. That's cheaper than a grande vanilla nonfat latte! (Not that I'm forking over for too many of those these days.) Adults with a library card get a 50-cent discount. And seniors 65+ are free! So swimsuit up, dig out the loose change from under your couch cushions and start splashing, L.A.! Despite the light sprinkles on Saturday, CC and I braved L.A.'s crazy drivers (who only seem to up the crazy quotient with added moisture) and docked at The Americana at Brand in Glendale for a taste of Noah's Ark and a kiddie drum circle. Let me explain. The outdoor mall (from the same people who brought you The Grove) hosted an event on the green that featured the popular animal puppet exhibit now on permanent view at the Skirball Cultural Center, as well as the tyke-friendly beats from One World Rhythm. Before we hit the road, I called ahead and made sure the droplets wouldn't put the kibosh on the whole event. Rain or shine, said the Americana rep. How appropriate, I thought, for Noah's Ark. Luckily, it didn't actually flood just to be event-appropriate. Once we arrived, CC was ready to grab a drum and join in the kid-focused rhythms. 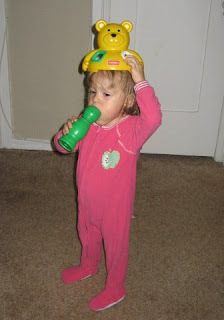 She jingled bells, clapped her hands and generally rocked out with the rest of the crew. Unfortunately, we arrived toward the end and didn't get to see any animals or make a pint-sized Ark, but we'll be hitting the Skirball on Friday to see the exhibit in person. Can't wait! And speaking of the exhibit, the lovely folks over at the Skirball have given me two pairs of admission tickets to give away on my blog. One set is for the Noah's Ark exhibit, and the other set is for their ZAP! POW! BAM! exhibition "The Superhero: The Golden Age of Comic Books, 1938-1950." 1. Leave me a comment on this post and let me know which pair you would prefer -- Noah's Ark or ZAP! POW! BAM! 2. Follow me on Twitter (I'm @la_story) and send me a message/direct message letting me know which pair you want. 3. Leave me a comment on this post AND follow me/send me a message via Twitter letting me know which pair you'd prefer, and I'll enter your name TWICE! I'll announce the two winners (one each for Noah's Ark and ZAP! POW! BAM!) on Monday, June 22. Am I wrong to have taken my daughter to Scoops after she had gotten on the wrong side of the mommy law? After all, the trip to the gelato shop was more for me -- and to help fight childhood hunger at their third annual No Cookie Left Behind Bake Sale. Honestly, my child is an equal-opportunity eater, and would have carrots as quickly as she would eat ice cream. Yes, she's mine. Yeah, I'm sure. Secondly, we were able to make a small contribution to Share Our Strength, a national organization that partners with communities and food programs to provide nutritious meals to at-risk kids. If you weren't able to make it to Scoops yesterday, you can also make a contribution here to Share Our Strength's Great American Bake Sale. Brace yourself, Effie. There are gonna be tears. Or that's how I imagined it would be when I first heard those three coveted words from my child. When it actually happened I was torn. Today is the day my daughter first told me she loved me. I can still hear it: Iiiiiiii .... Looooooove .... Youuuuuuuuu! She even crossed her arms over her chest, sign-language style while saying it. Had it not happened after she'd been brazenly disobedient, I might have been inspired to write my own Hallmark card, perhaps in Shakespearean sonnet. As it is, I had to reciprocate the (genuine) love through gritted teeth. We live in a building with fire escapes. The doors to these fire escapes are usually left open, which might be liberating for some but are a constant source of anxiety for me. When CC and I were heading out on errands this afternoon, she told me she'd rather walk than be carried: "No up. Walk." "OK," I said nervously, clinching every muscle that could physically clinch. As I turned to lock the door, she was off. And this kid is fast. F.A.S.T. By the time I finished locking the door, she was halfway down the hall. I knew I had to move quickly. In wedge heels, no less. No answer. It's like the kid had turned off her metaphorical Miracle Ear. When I finally caught up with her, I yelled so loudly, I was sure neighbors would complain. And she just laughed, thinking it was a game. First, there were kisses. No response from Mama. "We are NOT going to the park!" I growled. "Iiiiiiiiiiiii. ... Loooooooooove. ..... Youuuuuuuuuuuuuuuuuuuu!" Didn't know whether to hug her or sign her up for next year's gubernatorial race. Kid obviously has the politics down. The stork? How about Ikea? When I was little, my mother used to tease me by saying she found me under a cabbage leaf. I'm wondering if I should tell CC -- you know, when she asks "The Question That Must Not Be Named" -- that I picked her up at Ikea. And, better yet, here's proof! After all, the store does offer almost everything. I even picked up my cat, Sassy, at the nearby Burbank Animal Shelter -- just over the Burbank Boulevard overpass that crosses the 5 freeway. OK, OK, bad idea. You're right. No receipt. First was at breakfast. We were having cereal, and I was talking to CC, when she pointed to a spot above my lip and said, "Ouchie." Actually, it was a zit but I appreciated the sympathy. I touched it and nodded. "Yes," I said. "An ouchie." "Kiss," she replied, puckering her mouth slightly. I leaned in, and she pulled my face toward hers before planting a sweet one on the little red bump just under my nose. I almost cried. I've been kissing her ouchies for so long, I guess she discovered she could get in on the healing, too. OK, now I'm crying just thinking about it. Seriously. Then, on our way to the Grove today she was in the backseat burbling to her toys, blanket and books. I'd hear the occasional "Cow!" or "Moo!" But then I heard her first real sentence -- like, subject, verb and object. "I read the book!" CC exclaimed in the present tense. "I read the book!" Wow, talking and literacy all in one. I was truly amazed. All that even after our "ouchie" love-in. The photo above has nothing really to do with either of these moments, but I took it today at Barnes & Noble. I just want to be able to look back and see what my daughter looked like on this day. You know, 30 years from now when I barely remember my own name. Thursday at the Grove and no shopping?! Mama and baby recessionistas, say what? Yep, we hit the outdoor fountain-friendly mall today for its weekly (and free!) Kids Club extravaganza. Due to the questionable weather -- seriously, what is up with all of this gray matter, and not the smarty-pants kind? -- the normally alfresco event was re-routed to the third floor of Barnes & Noble. And, boy, was it crowded. Kids band Jambo performed, complete with kazoos, guitars, keyboards and an electric bass (at least I think that's what that was), and CC danced a little, sat a little and played with some stuffed Dora the Explorer toys that were too tempting not to touch. The Kids Club program at the Grove and the Americana at Brand in Glendale offers kid-friendly entertainment, including music, dance and other activities. Membership includes a free T-shirt, treats on your child's birthday and invitations to special events. In related news, the Grove also offers Monday Morning Mommy (and Daddy) Movies at 11 a.m. Next up is the appropriate "The Hangover" on June 15. Hey, it's no "Drag Me to Hell," but still. This morning CC and I ventured over to the Los Feliz 3 Cinemas on Vermont for its weekly Mommy & Me Matinee. Lucky for us, Disney/Pixar's "Up" was one of the films on the marquee. Lucky for a few reasons. First, I have yet to be disappointed by a Pixar pic (haven't seen "Cars," though, and heard some mixed reviews). Secondly, kids under 4 are free, so I just paid the matinee price for myself ($6). And, lastly, it wasn't in 3-D.
Yeah, yeah, I know 3-D is the wave of the future (now I'm starting to sound like grumpy ol' Carl Fredricksen), but CC just won't wear the glasses. As you might know from reading this blog, we took CC to see "Bolt" at the El Capitan for her birthday. While we thought the movie itself was adorable, CC refused about a quarter of the way through to wear the requisite eye gear. And there's nothing worse than fearing two hours of a blurry movie will somehow make your child go blind. So it was great watching "Up" in good ol' 2-D and commiserating with other parents as our children talked to the screen, jumped up and walked around ... and around and around ... and threw stuffed animals like it was a jungle pillow fight. OK, only mine did that. After CC tossed her monkey (why does that sound like a euphemism for something horrible?) behind us, a smiling mom handed it back and said, "I have a feeling there's gonna be a lot more of that at this showing." CC sat still for most of the movie and even seemed enthralled by it. I was in tears at least four times. 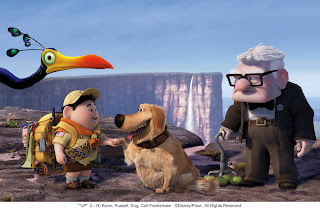 I have to say, it's amazing the emotion Pixar films can convey with few or no words. (See: "Wall-E"). After the credits rolled and we got up to leave, CC turned to the screen and waved. "Bye-bye, 'Up,'" she said. Make that five times for waterworks. Daily at 2:00, 4:30, 7:15 & 9:30 P.M.
Mommy & Me Matinees: Wednesdays at 10:30 a.m.
Now, who does not want to rock out with their baby on a Hollywood dance floor? Seriously. This Saturday, June 13, Baby Loves Disco: Who's Your Daddy? will storm into Cinespace from 11 a.m.-2 p.m. The Father's Day incarnation of the dance event invites kids from 6 months to 7 years and their parents to enjoy tunes from the '70s and '80s, spun and mixed by a local DJ. Admission is more than a movie but less than a concert at $15 per person in advance and $18 at the door. With previous Coming Attractions, I've tried to choose activities that boast minimal entrance fees. But this dance-tastic party looks to be a fun exception. 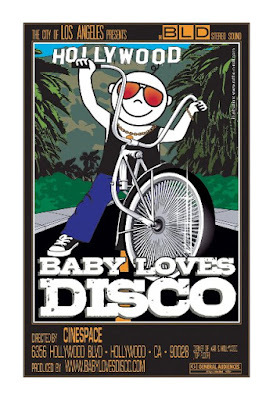 Baby Loves Disco has popped up in multiple cities across the country. According to its web site, there is no set structure but plenty of music, toys, bubbles -- and a stocked bar for non-driving adults. Baby Loves Disco: Who's Your Daddy? Yesterday was the perfect day to drive up the PCH to Malibu Bluffs Park for the third annual MUSE Lavender Faire. CC loved the open space -- she hit the ground running the minute I set her down -- as well as the music, dancing and games. We arrived just as her fave singer Debi Derryberry was about to exit the stage, but she did get to hit the two play areas and take in the ocean just beyond the bluffs. The faire served as a fundraiser for MUSE Elementary, which was founded by Suzy Amis Cameron and James Cameron (both of whom you can see in the top right corner of the top pic alongside Tom Arnold). The event hosted a green marketplace full of eco-friendly vendors under little white tents. Even the children were inherently eco-conscious -- I heard moms calling out for their little ones: "Luna!" "Harmony!" "Flower!" We indulged in some lavender lemonade from Divine Nourishment and chocolate yogurt from Sno: LA. And as we were leaving, CC got her groove on by watching kids perform to "Jai Ho" and showing off some smooth moves herself during "One World." The absolutely gorgeous Malibu surroundings -- the hills, the ocean, the green, green grass -- was the organic cherry on top of a healthy frozen yogurt sundae of a day. OK, so maybe I've been avoiding the inevitable. I've been a little nervous, especially after our bad bangs experience. Although I knew CC needed her little blondilocks (as my dad calls them) trimmed, I've felt a strange emotional attachment to them and was afraid of a new kind of postpartum depression. After all, her blond curls have fascinated this lifelong brunette ever since her hair started coming in lighter than expected. But when Ian's mom was in town last week, she pointed out the obvious: This toddler's hair needs a trim. After I reluctantly agreed to overcome my denial, we headed over to Supercuts in West Hollywood. CC was a little nervous herself at first, but our stylist was patient and attentive. Having games, lollipops and clips to distract her didn't hurt, either. In the end, my little blondilocked toddler turned into a sleek looking little girl. The bob may have booted the curls, but she looks great. And, hey, the ringlets might be back. In the meantime, we have an adorable certificate from Supercuts that notes the date and even holds a lock of CC's hair for posterity. As a treat, after our haircut mission, we headed over to Los Feliz, where we had dinner at our old haunt Fred 62 and stepped into Skylight Books. Ian, his mom and CC booked it to the children's section for story time. Do not be fooled by this photo, parents of tiny tots. It is a wonderland, for sure, but a wonderland for big kids. Toddlers need not apply. 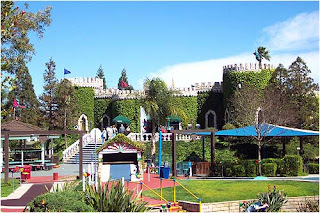 Although a beautiful and accurate representation of Sherman Oaks Castle Park on Sepulveda, this pic seems to imply a playground for kiddies. Well, folks, it's all mini golf course and arcade. Which is great, but not what I had promised for my weekend play date. No offense to Castle Park. CC and I will be heading there again when she's a little older. I just thought it would be a great place to take the little ones on a weekend play date with a friend from the Valley. Little did I know my small hiccup would turn into a comedy of errors. Seriously, my fellow LA Moms Blog contributor Kim, who is a blogger extraordinaire at House of Prince, may never want to darken my door -- much less my blog -- after this weekend's example of Murphy's Law. 1. I picked the wrong place, which ended up in relocation -- to the accommodating Van Nuys Sherman Oaks Recreation Center. 2. While flailing nervously and talking with my hands, I turned into the abusive parent by scratching Kim's eldest son with my engagement ring. Damn you, Blue Nile! 4. CC falls off a bench and hits her head. Makes horrific sound. I somehow avoid child services. (Kim wants to exit, like, 5 minutes ago, but is gracious and offers ice cream). The fact that I'm not in 'cuffs right now is somehow a sign that I did something right at some point in life. Let's hope God, karma and Kim (a Notre Dame alum, which means something to this Catholic) are really forgiving. Btw, CC is fine. Nothin' but a playground thang for this toddler. The best part? She still loves me. 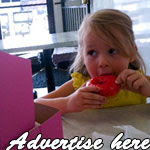 Check out my latest post on Los Angeles Moms Blog: Unemployment puts new spin on feminism. Who knew that even I -- career-focused since the womb -- could become a novice domestic diva. Or at least domestic dabbler?! 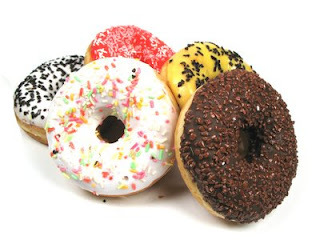 Thank God and the Salvation Army for National Doughnut Day! Yes, you read that correctly. According to the Salvation Army web site, the first Friday in June was set aside in 1938 to commemorate Salvation Army volunteers who braved the front lines in World War I (!) to serve the tasty treat to soldiers stationed in France. I always knew my donut obsession was for a greater cause. Dunkin' Donuts and Krispy Kreme stores are offering free donuts today, but if you're looking for something a little more upscale Grace Restaurant on Beverly Boulevard is celebrating all weekend with a gourmet tasting menu. Now, time to make, er, eat the donuts. L.A. Zoo: Chefs, hot dogs and bears, oh my! It was an early morning for CC and her entourage as we hit the Los Angeles Zoo to watch chefs from around the city feed a pair of California Black Bears. The event served as a preview for the 39th annual Beastly Ball fundraiser, to be held June 20 among the zoo's lively inhabitants. Culinary experts from such L.A. restaurants as Pink's, Yamashiro, Spitfire Saloon, El Cholo and La Poubelle prepared watermelon bowls full of goodies like carrots, lettuce, kiwis, papayas and mackerel for the hungry duo. I have to admit, when I heard Pink's would be there, I couldn't wait to see a bear negotiate a bun and a little relish. Would he go for the chili dog or plain with mustard? Turns out, the hot dogs were for the salivating onlookers, and selfishly, I was fine with that. In addition to brief speeches from L.A. Zoo officials Connie Morgan, John Lewis and Tom Mankiewicz about the Greater Los Angeles Zoo Association (GLAZA) fundraiser, City Council member Tom LaBonge (outfitted in an orange L.A. Zoo T-shirt) offered his support and warned listeners, "Don't tell my doctor I'm (at Pink's) all the time." Beastly Ball honoree Laura Z. Wasserman also stepped to the podium (in killer red heels) and mentioned how growing up in L.A. strengthened her commitment to the zoo. Listening to her talk about life in Los Angeles made me wonder what my little Angeleno would cling strongly to as an adult, what adventures would serve as her most vivid childhood memories. After the chatting, it was chow time. And Pink's was certainly ready. My little munchkin devoured nearly a whole hot dog, mustard, cheese (much to Ian's chagrin) and all. These restaurants will be back in action for the Beastly Ball, donating their services to the event. GLAZA chairman Tom Mankiewicz told me the ball is not black tie but a great outdoor party held among the nearby bears, tigers and gibbons. Some especially creative attendees, he added, sometimes bring out the safari gear. Tickets to the ball are $1,000 per person -- a little steep for this L.A. explorer but hopefully a reasonable donation for generous supporters from around the city.